The Southern Tier Meetup, which is in its fourth year, has reached its conclusion said Dan Mori. Mori said the answer was more targeted events that focus on different segments and areas. He said the Meetup did not want to be a competitor or redundant and will only meet annually from now on. For four years the event met monthly bringing small businesses together with experts in different fields to share knowledge and best practices. Mori contributed the success of the event to the lack of anything similar in the area. Since then the meetings have been held all around the Southern Tier, including Horseheads, Corning, Nichols and Binghamton, among other areas. Below are some of the meetings in the Southern Tier that focus on specific areas. If you can’t find what you need please go to (UVC Site) where there is a full calendar of events in the area. This monthly meeting, held on the first Thursday of each month, brings together area entrepreneurs and businesses to discuss a variety of topics including energy, retaining young professionals and putting ideas to work through strategic doing. For more information contact sunybest@binghamton.edu. Thomas Kowalik wants people to know the information they hear about the Southern Tier isn’t the whole story. 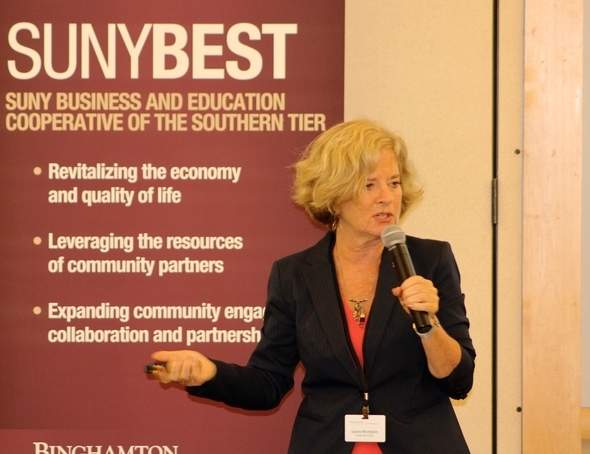 Speaking to around 100 people, Kowalik focused on how the ideas generated at SUNY BEST could be put to work in the community. 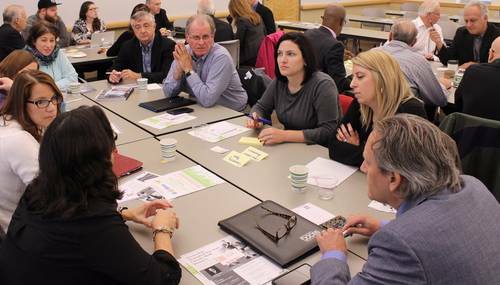 The meeting, which was a follow-up to October’s focus of keeping talent in the area, had participants split up into groups to brainstorm ideas for making the community a more attractive place for millennials. During his talk Kowalik noted the characteristics that make a downtown successful, such as: distinct natural features, historic character, public-private partnerships and public art. Kowalik then showed a TED talk given by Jason Roberts titled “How to build a better block.” Kowlaik said he wanted to show the group present what a small group of people could accomplish for their community. “I want to inspire you to say ‘I can make a difference with just my passion and energy,’” he said. An impediment to that, Kowalik said, is our tendency to think in certain ways. After asking the group to complete a task he stressed how everyone completed it in a similar way—even though that was not the only way to accomplish it. With that, the room broke up into brainstorming groups focusing on improving the Binghamton area. Some of the ideas the groups came up with are: a website for job availability, more walking and biking trails, a performance amphitheater, and a solar art installation. After the brainstorming was complete and the ideas had been put together some participants began forming groups to complete their ideas, which Kowlaik said had been the goal all along. Near the end of the event he stressed the importance of sticking to an idea and seeing it to completion. “I think we have created something neat here. You have generated these ideas so quickly, in just seven minutes,” Kowalik said. “The key takeaway for the day is to stay focused, stay energized and don’t talk yourself out of doing something. Turned is an On-Demand Delivery App to Buy, Sell & Rent goods and services. The first of its kind, the app allows users to advertise their need and location. It can also be used to sell or rent anything a user has or needs. To learn more read this article by The Odyssey. A bad hair experience inspired Gwen Ou to start Crownshot, a website that connects people to hairstylists. Crownshot would show people photos of stylists’ work so that people could decide which was the right stylist for them. Ou spoke to a panel of three evaluators at November’s Idea Pitch. The panelist’s included Ken McLeod, Scott Moser and Kyle Washington, all whom emphasized the need to show why a concept is novel. Each presentation was scored on a scale of one to 20, with 20 being ready for funding and scores of 10 and below needing more work on the concept. McLeod, the Entrepreneur in Residence at the Office of Entrepreneurship and Innovation Partnerships (OEIP) said the goal of an idea pitch is to determine the stage of an idea. McLeod said teams were judged in four areas: Do you know what you’re doing; How did you come across this idea; Is the idea innovative; and what is your next step. For one group their idea came from something European’s have been using for a while, the bidet. Matthew Bickoff and Chase Brown of MB Bidets want to improve the bathroom experience using an attachable bidet that would hook into a pre-existing toilet. Moser, the Technology Licensing Assistant for the OEIP, was concerned that the idea wouldn’t be different enough from current products in the market. The duo said they would like to include things such as a phone charging station or pressure regulator to their device. DormShare wants to physically connect people using the internet. The app would include three functions: Want and Have, which connects people who have something others want; Watch, which would allow people who want to watch the same thing to meet up; and Studying, which allows students in the same class, especially large lecture classes, to meet up and study. The group said they had tested the app hypothetically by talking to students about it. One group had moved from the hypothetical to the physical with their company Rope You In. Jaqueline Himelfarb and Samantha Tenenbaum, the co-creators of the company said the idea came to them after Tenenbaum saw something similar in a boutique on long island that was above her price range. Since its creation the company has grossed over 8,000 dollars and sells in three boutiques. The main issue they are having is scaling up production to meet the increasing demand. Juliette Kenny welcomed hackers, both new and old, to the first ever Hack AE. 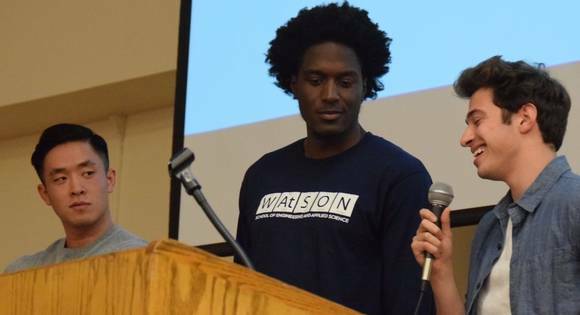 The event, which is the first time an athletic conference has held an academic conference, took place over the weekend of November 5 with approximately 150 students in attendance. It was held in the Innovative Technologies Complex at Binghamton University. During the opening ceremonies University President Harvey Stenger focused on the caliber of the hackathon. The students spent 25 hours working on their projects and building skills such as teamwork, coding and critical thinking under a time constraint. 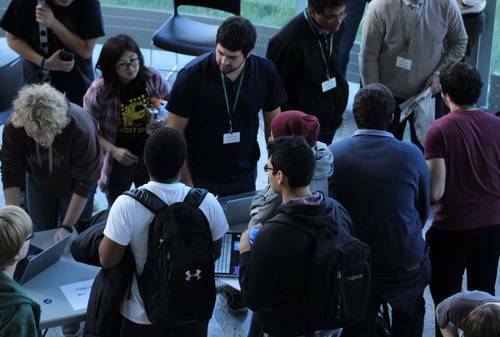 Holly Butler, the project director of the DifferenceMaker Project (DMP) at the University of Massachusetts-Lowell, said they held their first hackathon last year and were hoping to learn from Hack AE in areas such as scaling it up. She also said that some of the method’s she teaches to students in the DMP came into practice. Butler said that hackathons are invaluable resources for students to learn skills they might otherwise not. Students came from the University of Albany, Stony Brook University, University of Massachusetts-Lowell, Binghamton University and more. For Noah Katz the previous experience and proximity drew him in. On the second day of the event the creations were judged by a panel and won based on categories such as Overall Winners, Funniest Hack, Best Education Hack, Best Beginner Hack, as well as categories sponsored by Viacom and General Electric. The closing ceremonies echoed the sentiments that Kenny gave the day before when she focused on the purpose of the event. According to William Acker our energy grid is not designed for today’s needs. Acker was one of four panelists to speak to a room of over 50 at November’s SUNY BEST. The event was held in the University Downtown Center and focused on the future of energy storage while featuring a variety of speakers from the field. While the forms of energy storage are varied, including batteries, hydro-electric, flywheels, capacitors, compressed air as well as others, the goal is simple—to store energy for when it is needed. Ravi Tetambe, the program manager for Renewable Resources Optimization at NYSERDA said that 70% of wind turbine energy is produced at night, when it is not needed. In order to meet the goal of making New York state powered by 80% renewables by 2050 energy storage will need to be increased. One of the areas energy storage options discussed were capacitors, which rearrange ions to both store and discharge energy rapidly. Chad Hall, the senior vice-president of Sales and Marketing for Ioxus, Inc., said capacitors are 98 percent efficient and have a longer cycle life. A cycle is when a storage device charges and then discharges. Capacitors have lifetimes of millions of cycles, while the lithium-ion battery is around 1,000 cycles. One of the ways in which energy storage can benefit the electrical grid is through smoothing, or maintaining energy available in relations to energy needed, said Dr. Stanley Wittingham the director of NECCES, a group that studies the fundamentals of the lithium-ion battery. Wittingham, who is one of the inventors of the lithium-ion battery, said that while the Li-ion battery has great energy storage compared to weight, it is not enough and it doesn’t meet the theoretical limit. Increasing the amount of energy that can be stored is one of the goals of NECCES Wittingham said. For Ken McLeod entrepreneurship is about more than starting a business. McLeod spoke to over 100 students in the Mandela Room on the importance of entrepreneurship. Along with McLeod, six other students spoke at the event that was sponsored by the OEIP, Harpur Edge, Enactus and other student groups. McLeod also spoke to the importance of entrepreneurship in economic growth. While Established companies are focusing on increasing profits by decreasing the number of employees, startups focus on growing through hiring new employees. Tremayne Stewart talked about the impact entrepreneurship had on his personal growth. The creator of CConnect, an app to centralize communications in non-profits and student organizations, said in 2012, when he decided he wanted to be an entrepreneur, he would go onto the subway and introduce himself to his fellow riders. All with the goal of getting over his shyness. The key to getting others interested in your idea is to show them you are passionate said David Axelrod, the creator of Loom VR, a language learning program that uses virtual reality to immerse you in the language. He advised students to create a “Garage Prototype” to show to possible investors and teammates to show your commitment. He said the chances of success are increased when working in a team. “The complimentary skillset that somebody else can add drastically improve your probability of success and drastically improves the final product,” Axelrod said. The story behind Chick-N-Bap, one of the most popular food options in the Marketplace on campus, is the quest to find food from home said Sung Kim, creator of the Korean inspired food. Kim told the audience that when he started his company he had little support, but that his own competitive spirit drove him. He hopes that with the popularity of Chick-N-Bap’s food it will encourage students to try more common Korean food. Mauricio Morales, the creator of Tibah, a chat bot that aims to make fitness and being healthy a habit in the lives of its users, talked about the success his idea had in the beginning. But as he added updates and changes, the feedback wasn’t all positive. He said user feedback is critical in the success of a product. 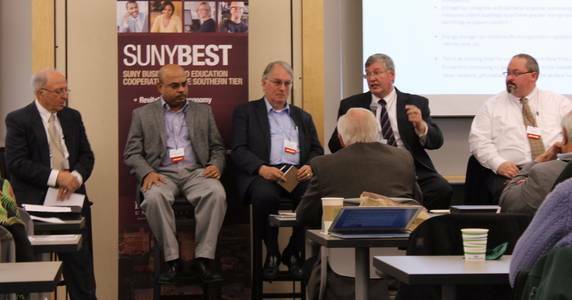 This past Thursday SUNY BEST featured something it never has before—a panel. The panel, made up of young professionals from the area focused on keeping young people working and living in the Binghamton area. 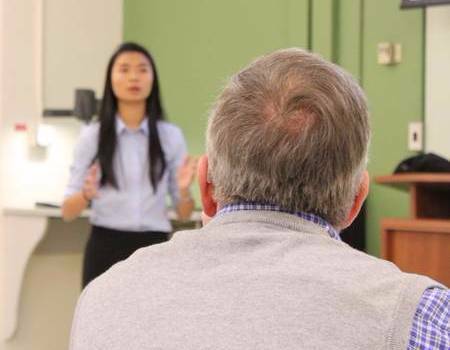 The audience of around 80 people was also given the opportunity to voice their issues when it came to maintaining a younger workforce and to ask questions. -Make sure students never leave. -We need to spread more information on the area on social media, since that is where younger generations looks. -Dispel the myth that Binghamton is too small. -Share the startup community energy. -Dispel the myth that it is hard to make social connections here. For Laura Bronstein there is no one way to improve a community. "It is a combination of looking at what is out there so we are not reinventing the wheel,” the Dean of the College of Community and Public Affairs (CCPA) said. “[And] looking at the local initiative and listening to people. ”During a talk at the September SUNY BEST (SB) meeting Bronstein emphasized the location of the CCPA is a part of the revitalization in downtown Binghamton. Bronstein said that issues such as poverty, barriers to education success and transportation, among others need to be addressed in Binghamton. But she also emphasized the strengths of the community such as, increased job opportunity, greater diversity and an increased entrepreneurial culture. Adding to that culture is the CCPA the dean said. The CCPA sponsors and is involved with projects that impact and improve educational opportunities and the local economy. During each academic year CCPA undergraduate students spend 5,040 hours total in internships and service-learning opportunities. For graduate students that number is 33,720 hours. Increasing the community and economic vitality or the region is done using three strategies, which are: rigorous and informed research, service learning, and mutually beneficial partnerships. The second speaker of SB was Melinda Sanders, the upstate director of the New York State Mentoring Program. Sanders said the program pairs students at the cusp of success with mentors from organizations in their area. The program targets fourth through fifth grade children, an area where they believe they will have the most success. The children meet with the mentors once a week for an hour and the focus of that hour is improving student’s academic performance, school attendance and behavior. 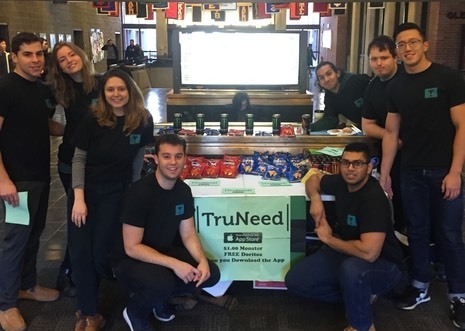 Local partners in the program are Binghamton University and Modern Marketing Concepts. SUNY BEST is a monthly meeting put on by the Office of Entrepreneurship and Innovation Partnerships. For more information on this event please visit here. A team from Binghamton University was one of five to win bronze at EMedic Global 2016. The team was comprised of seven students with six biomedical majors and a computer science major. The competition, which took place on August 18 to 20 in Hong Kong, worked to promote innovation among biomedical engineering students worldwide Kenneth McLeod said. The Entrepreneur in Residence at the Office of Entrepreneurship and Innovation Partnerships said the team’s device was the Tre-no-mor. The device, a glove, would counteract tremors caused by Parkinson's Disease, a rotational tremor which impedes those with Parkinson’s from doing activities such as drinking coffee, combing their hair and buttoning their shirts. The device was scored based upon clinical impact, novelty, technical merits and presentation. Twenty-seven teams presented at the conference with five continents being represented.